In school and in the office, someone is - generally speaking - watching over your shoulder and making sure you're doing what you should be doing. You can get away with slacking when they're not looking, but you still have to report to someone at the end of the day, or the week, or the semester. For most, this is a strongly contributing factor in doing what you're actually supposed to be doing. But this factor is non-existant in poker: You won't have anyone to report to, there's no one who expects or requires that you do anything. You are, for better and - in this case - for worse, your own boss. When the only one you have to answer to is yourself, it takes a fair portion of discipline to actually do what you set out to do. ... Or at least it should. If you've given yourself a lot of slack in what you hope to achieve, this will be a walk in the park. 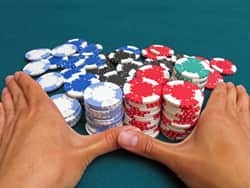 But if you're serious about taking the road of poker as far as it will carry you, your goals probably shouldn't have too much leeway given for slacking. You should challenge yourself. Discipline is needed for many different areas of poker. For instance, returning to Lesson #2 and the Anna example there, if she has set out to play 5,000 hands per month, she needs to actually do that. Hopefully, you won't need to much discipline to play the game. If you find that you just don't want to play, then there is an obvious risk that you shouldn't be focusing on this game at all. But Anna also specified which limits she was going to play at, and conditions for when she would move down or up in the ranks. Really sticking to this, and not refusing to move down after a bad downswing takes discipline; we all have a little devil on our shoulder telling us that if we stay at the limits we're playing (or even climb!) we can quicker win back what we've lost. Resisting that urge takes discipline. The previous lesson dealt with realistic goals in building a bankroll, with the basic conclusion that it takes time, because the relative profits that are made are low in comparison to the limits we play. If you make one or two big bets per hour, how many hours of playing does, for instance, logging on and playing while being roaringly drunk cost you? I'm not saying you can't be outrageously drunk (I'm all for that) but recklessness can easily set you back weeks in terms of bankroll progress. It's unnecessary. You also need to be disciplined about other things, such as studying. If you've told yourself that you will sit down and carefully read and analyze hands three hours a week - because you know how important this is to your personal development as a player - your job is not done there. Making the decision is easy, it's actually doing it that's hard. "Easier said than done" is rarely as true as when it pertains to planning homework. But while on the topic of studying, again, I want to point out that while you'll need some discipline to do the time that you've promised yourself you'll do, the part that's actually going to require more discipline is the self-criticism, so let me talk about that. Psychologically, people are mostly very defensive. There are, for instance, countless courses on how to give and take criticism because of this. I've attended a few in the line of duty. If we were computers, receiving criticism would be a piece of cake. Someone tells us we screwed up, we look at the situation, objectively decide that he's correct, and adjust. In reality, however, someone telling us we screwed up will trigger all sorts of self-defense mechanisms in our psyche. The most common reaction is to claim that the criticism doesn't apply to us. The second is to vividly argue (or at the very least, feel) that we didn't screw up at all, and dismiss our critic as ignorant: "he would never bluff in that spot!" or to blame something or someone else. The third way of defending ourselves against criticism is to give excuses. Accepting criticism and embracing it is tough, and for me personally, it's even harder to give criticism that I know can be accepted and embraced. However, when you're asking someone else to analyze your play, you're in most cases not asking someone who's professionally trained to give sensitive criticism, so chances are he or she won't be as smooth or as harsh as they need to be. And so again, you need the discipline to take it for what it is - someone else helping you. But even after getting sore spot after sore spot poked at by other players, you need to swallow your pride and keep asking for more of it. This is the part that really takes discipline, but it will pay off and it's worth it. Now, speaking of sore spots, I have one more piece of advice relating to discipline to share in this lesson: the importance of being honest to yourself when things aren't working the way you want them to. Maybe you're not putting in as many hours of studying as you had originally planned. Maybe you went on a terrible downswing and hesitate to re-count your bankroll to see just how bad it's been going. But you already know that you should, and the only thing standing between you and something you can and should do, is to actually do it. Discipline. "Easier said than done." Yes, it is.